Poll after poll showed that Clinton would be the next president of the United States. They also showed that even though Trump supporters said that they would vote for him, they still expected him to lose – they expected a Clinton victory. Poll after poll were wrong. What happened? Why the misleading numbers? How do I make sure that I don’t make the same mistakes and misread the signs when designing and launching products? Launching a successful product can seem like a crap-shoot. You roll dice and hope for the best. In the wake of Donald Trump’s stunning presidential victory, there are four lessons that those designing product/service launches would be wise to heed. Let’s take a look. People don’t like Donald Trump. It was obvious. Even people in his own party were against him. Heck, when is was clear that Trump had won, MSNBC host Rachel Maddow wasn’t even subtle in her dislike of the President Elect. With this type of negative environment being prevalent, people who were pro-Trump didn’t want to be seen as supporting someone who was so hated. The result? They either lied and said they were voting for Hillary, or claimed they were undecided. The lesson here, is that people need to feel welcomed and accepted if you’re going to get the truth out of them. If you’re designing a product and the users don’t trust you, or think that somehow their participation in a research study will impact them negatively, odds are you won’t get the truth. Build trust and give people a safe zone to say what they want. But be careful, this is only part of the story. History is replete with products that tested well in focus groups and then failed miserably when launched. One of the main reasons for this is that people will tell you what you want to hear. Or, they simply don’t know what they want so they pick whatever it is you’re showing them and they say they like it. Focus Groups can be funny things. Are people really telling you what they think, or are they telling you what they think you think they think? Some years back I was working on a project that was a ‘next generation’ version of a medical product I had designed the first generation of. Only two years had passed, and while the market, and the medical procedure the product served, hadn’t changed appreciably, I made sure that I wouldn’t be the only one doing research. I called in additional researchers/designers to watch the procedure and asked for their feedback. I was afraid that I was only going to see what I wanted to see and end up with a slanted, if not erroneous, perspective on what the doctors were doing. In this election, pollsters anticipated reality. Pollster John Zoghby believed that polls were too heavily slanted Democrat. This lead to over-estimation of a Hillary Clinton lead, if it was even there at all! You’ll never see reality if you think you already know how reality behaves. We see what we want to see. We may not be malicious about it, but sub-consciously we think we know what’s really going to happen, so we set up our research to prove that true. In the world of product/service design research, we need to find out what’s going on, not prove we’re right. The stakes are too high. Companies, organizations, communities are investing in a product that is supposed to pay them back in some way. Not understanding the situation is the first step to catastrophic failure of a product launch. Yes, you can be the first to predict reality, but often the better route is to let things play out a little more and then jump in the game with a passionate verve! This has the advantage of getting actual data, actual feedback. This information is much more actionable and since everyone else is wrong, being a little late to the game won’t be a negative, it’ll be a huge positive! If you believe that you need to predict reality and launch at a specific time and place, then don’t pick one horse in a race. Place multiple bets. Have a Plan B, and Plan C…Plan(x). Then, as reality starts revealing itself, roll the appropriate plan into action with modifications as needed. Incidentally, the first generation product spoken about in the beginning of this article was just such a multi-plan launch.. That enabled it to launch with the right components at the right time, even though the very beginning was touch and go understanding what was truly essential to the offering and what wasn’t. In the end, we got it right. That’s ultimately what it’s all about – getting it right. One way we can get it right is to learn from what others have done wrong. So regardless of whether you’re crushed or elated with this election (or perhaps even feeling a little of both!) pay attention to these four tips based on what was done wrong, and your next product launch won’t unexpectedly fail – you will get it right! I love it when folks share their insights into innovation, especially when they share as prolifically as the folks over at Autodesk do. If you, like I have, have checked out the new products in Autodesk Labs, you probably wonder how they are able to create really cool product after cool product. The reason is simple: it’s because they don’t innovate in a chaotic manner. They have a process that guides and informs their product development efforts: the Autodesk Innovation Genome. The process is essentially five steps. Steps One and Two establish Context and Direction. Step Three is at the heart of this process – the Seven Questions. Of course, ideas don’t mean anything without a method to commercialize, so steps four and five are about prioritizing and executing. 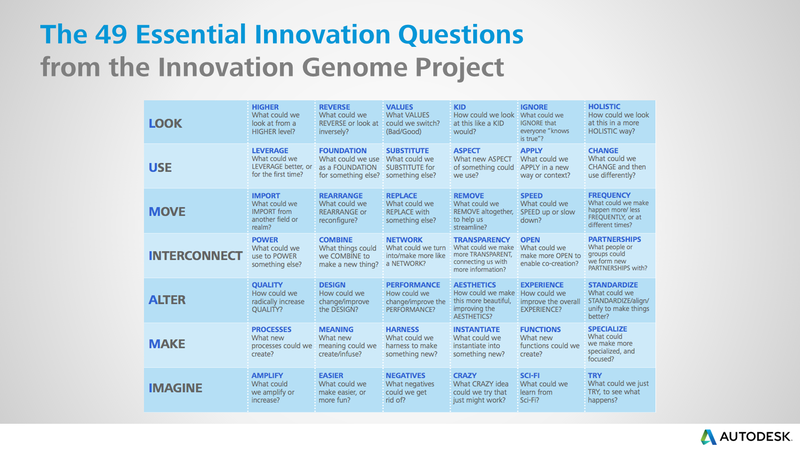 I could go into this even more, but really, just head over to the Innovation Genome and check it out for yourself. There are multiple excellent resources there. Study, learn, modify/apply, share.